← Novasure treatment for vaginal bleeding is a significant improvement. 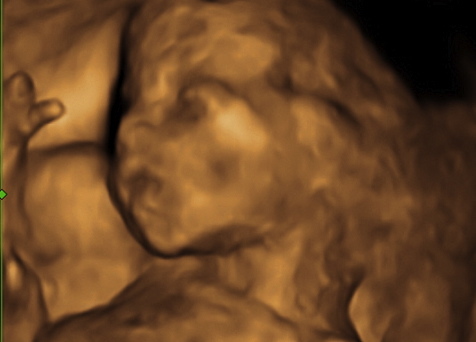 The images that we see with modern ultrasound are amazing. The technology is much improved. 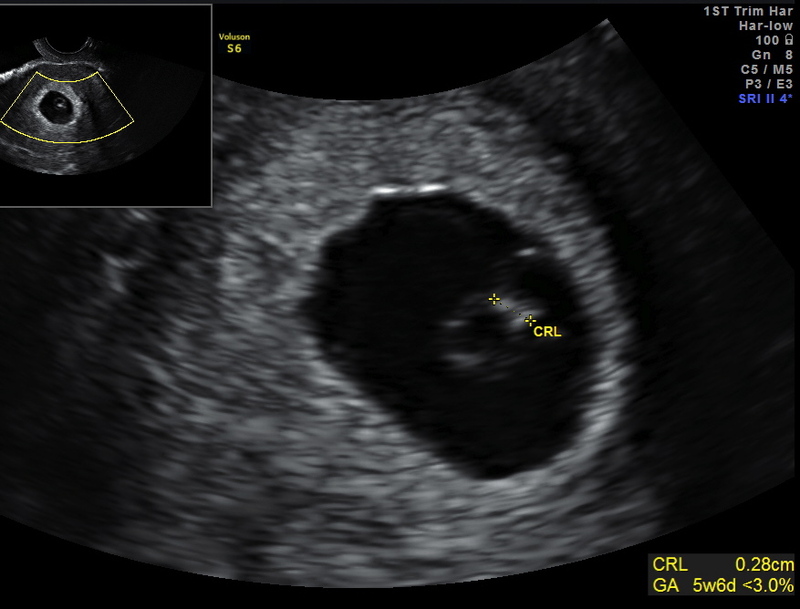 Here is a picture of a fetus at 21 weeks of gestation taken at our office with our new GE ultrasound. You can see the features of its face very well. Ultrasound can be very helpful to evaluate the growth of the fetus, check its development, and look for problems. We can determine an accurate due date, look for twins, help predict when the pregnancy is healthy, and when a miscarriage or tubal pregnancy could occur and evaluate pregnancy well-being as it progresses. Here is a very early pregnancy at only 5 weeks of gestation. You can see that the measurement of the fetus, called CRL or crown rump length is only 2.8 millimeters! Even though the fetus is very small we were able to see the movement of the fetal heartbeat during the exam. When the fetal heartbeat is present, it means that the chance of having a miscarriage is very low. 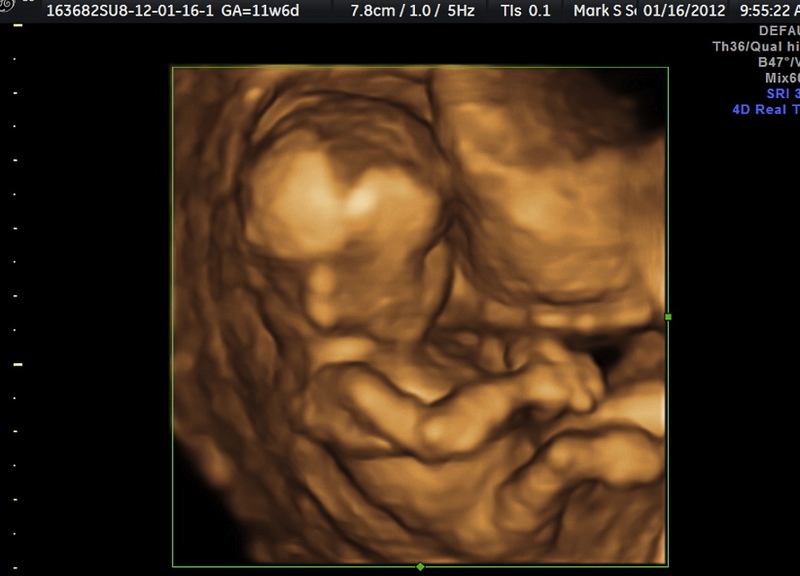 This is an early pregnancy seen in 3D at 6 weeks of gestation. 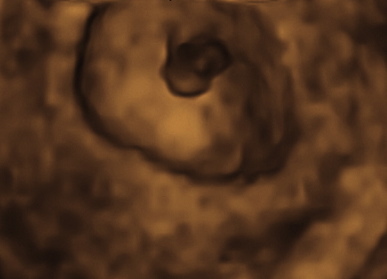 The fetus is the solid area in the center. Next to it at about the 2 o’clock position is an early supporting structure, called the yolk sac. This is normal very early fetal development and seeing it is very reassuring . By 12 weeks of gestation you can see the incredible changes that have occurred with the growth and development of the fetus. It is now much larger and we can see many more details of anatomy. This is the time of pregnancy where we perform a test called first trimester genetic screening which can help identify which fetus may have a greater risk of genetic problems including Down Syndrome, Trisomy 13 and Trisomy 18. In most cases the results are normal and we find out very early in pregnancy that the chance of a genetic problems is very low. By 20 weeks the fetus is much larger, and the details of its anatomy are easier to see. We check for problems in the fetus, check the location of the placenta, look for its position, its growth and development to determine if they are all normal. By this point the pregnancy is half over, and the appearance of the fetus is becoming more and more what it will look like after it is born. Looking at the fetus with ultrasound gives us images that are magical. This entry was posted in Our Office and tagged Evaluation of Early Pregnancy, Genetic Testing, Gestational age, Miscarriage, Pregnancy, Ultrasound. Bookmark the permalink. 2 Responses to Pregnancy Ultrasound is Awesome. It’s really cool that husbands and wives could already know through ultrasound if fetuses are going to be normal simply by their position in the placenta after 20 weeks of pregnancy. Aunt Rose would definitely love to have her regular pregnancy ultrasound checks digitally recorded on DVD, so she could review her first baby’s development in her womb. This is not only a testament to God’s wondrous works, but to Nature’s grand design over humanity. This is nothing but fantastic!